Here is a look at the top five future performance vehicles that may be coming to showrooms around the world soon. The styling of the Mercedes-AMG Project One speaks for itself. The 1,000-plus horsepower engine, quad electric motors and all-wheel-drive powertrain speak even louder. How would you like a Formula One car for the road? 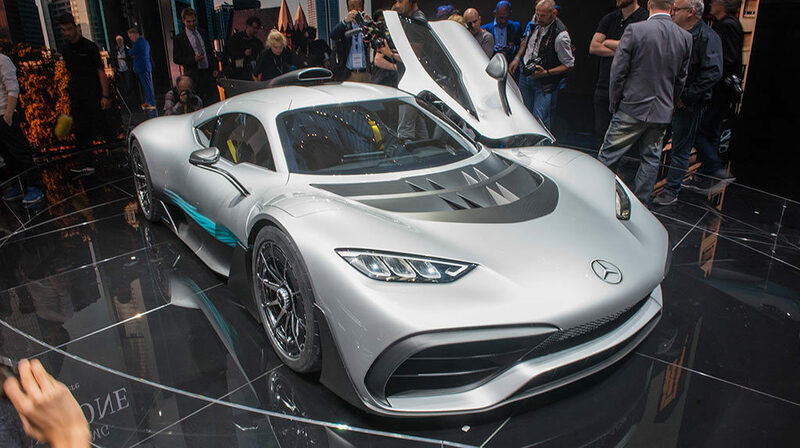 Applying lessons learned from their F1 race car, the Mercedes-AMG Project One aims to make owning and legally driving a Formula One inspired car on the streets a near-future possibility. 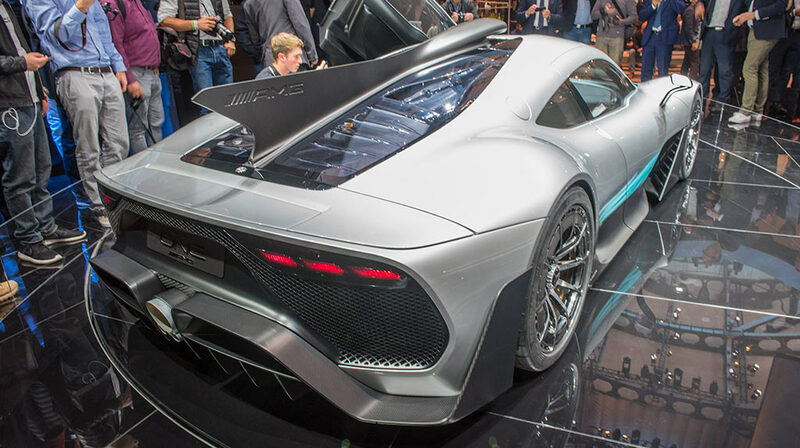 The Mercedes-AMG Project One has a mid-mounted turbocharged 1.6-liter V-6 augmented by four 161-horsepower electric motors for 1,000-plus horsepower. The Jaguar I-PACE eTrophy racecars will be built by Jaguar’s Special Vehicle Operations center in Warwickshire, UK. This one fits in both electric-car news and impressive performance. 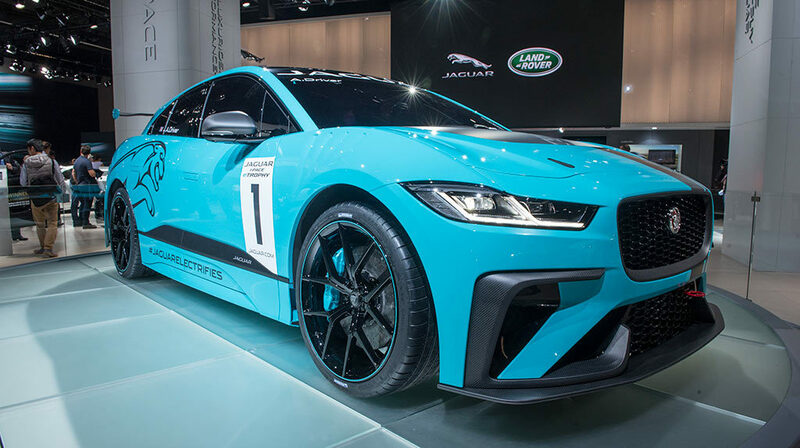 Jaguar announced the new Jaguar I-PACE eTrophy all-electric race series (for production-based Jaguar electric cars) to support the FIA Formula E championship. Of course, a race without cars to compete isn’t very exciting, so Jaguar unveiled the I-PACE eTrophy racecar based on the upcoming electric Jaguar I-PACE. The race will feature a grid of 20 of these specially prepped Jaguars on some of the most famous tracks in the world currently used for FIA Formula E Championships. No racecar specs were revealed, but we do know the series will begin in late 2018. The 550-horsepower twin-turbo in the Porsche Cayenne Turbo is said to have a 0-60 mph acceleration time of 3.9 seconds in standard trim. 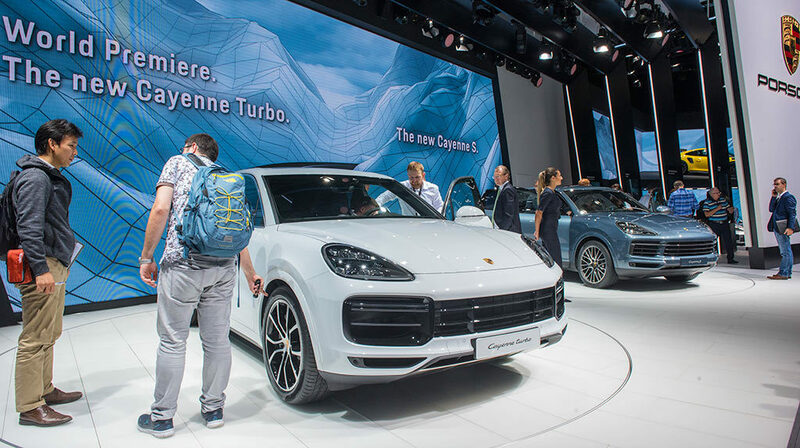 When the new Porsche Cayenne was shown earlier this year, the company decided to wait until the Frankfurt show to share the top-power variant, the Porsche Cayenne Turbo. It features a new twin-turbo 4.0-liter V-8 that produces 550 horsepower. The Cayenne Turbo has unique exterior details, including wider air inlets in the fascia, quad-tipped exhaust and 21-inch wheels. The SUV also has a new air suspension with active shock absorbers. In addition to better handling and comfort, the system has six selectable height levels and five driving modes for on- and off-road performance. Hey FCA, where are you guys at with a Hellcat version of the Durango? The all-new Audi A8 was revealed at the 2017 Frankfurt show. The advanced self-driving capability of the car overshadowed the new exterior and interior design. 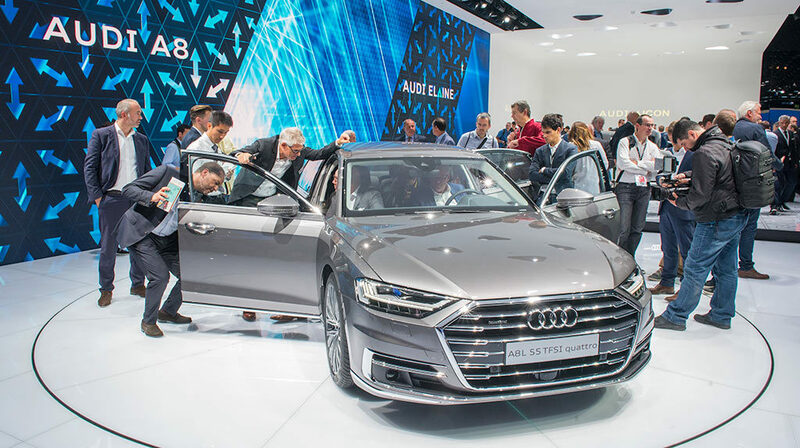 Audi debuted its long-awaited all-new A8 at the Frankfurt show. The A8 is the brand’s luxury flagship, and the new model is packed with advanced technology and a high-caliber design, materials and fit and finish. One of the most interesting new technologies available on the fourth-generation A8 is called Audi AI, as in artificial intelligence, which offers self-driving in most situations up to speeds of 37 mph. The system also acts as an electronic concierge, using natural voice control. The system learns your preferences and history to provide intelligent search suggestions. Ford showed new trim packages for its very popular Fiesta and Focus models. But the car that was the center of attention – literally located on a turntable in the middle of the display – was the Ford Mustang. Ford Motor Company announced several new packages for European models such as the EcoSport ST-Line and Black Edition of the Ford Ranger (the current, non-U.S. version of the Ranger). 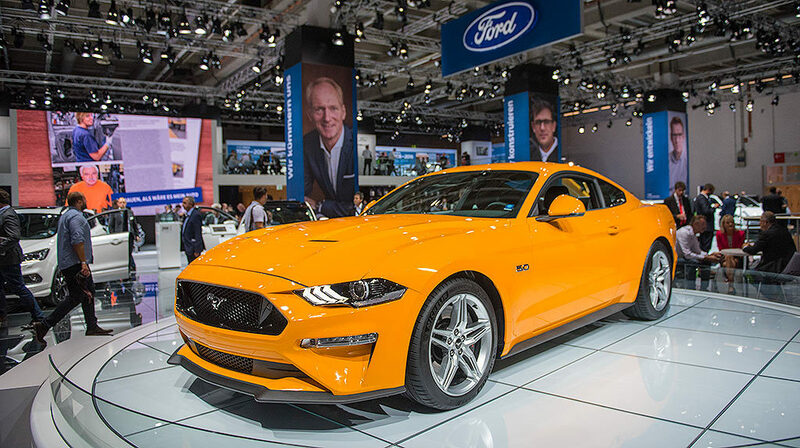 Ford also showed the new 2018 Mustang for the first time in Europe, which features revised styling, giving the base-model even more of a performance look. The new Mustang has three new driving modes: My Mode, for customizing performance, dynamics and exhaust sound and Good Neighbor Mode, which uses the new active exhaust valve to allow the owner to limit exhaust noise at certain times of day or night. And Drag Strip Mode optimizes performance for straight-line acceleration from a stop. The 2018 Mustang also has electronic line lock as standard equipment for smoky burnouts on the racetrack. Love to know if I could convert H pattern gearbox into a direct shift gearbox.